Christ the King Catholic School in Warradale, Adelaide is geared with a linkup Wednesday (March 20) at 5.45pm Central summer time. The contact will be done using the ARISS telebridge network, a worldwide network of amateur radio ground stations that enable students to contact the ISS. The ground station selected for this linkup will be I K 1 SLD operated by Claudio Ariotti in Italy. Christ The King School have some very excited students waiting to ask astronaut Hadfield 15 questions, just as the Children from Mt Ousley Public School did last Tuesday, March 15. Twelve students had been chosen to ask questions to Astronaut Kevin Ford KF5GPP who is the commander of the International Space Station. The conversations occurred while he was travelling at 27,000 kilometres per hour at an orbit height of 380 kilometres above the Earth. 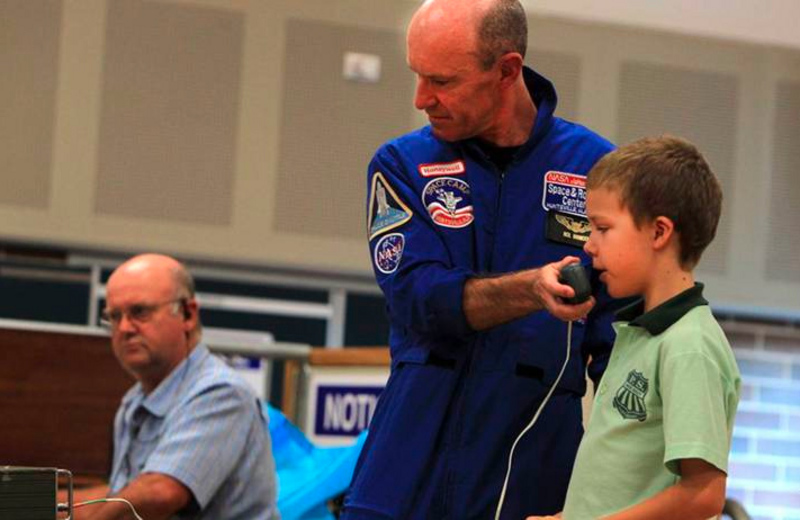 The event took place with the assistance of the Illawarra Amateur Radio Society, working with ARISS - Amateur Radio on the International Space Station. The connection to the Space Station was performed by Claudio located in Italy, with the audio then passing through NASA's conferencing bridge to the school's auditorium. The Australian ARISS Co-ordinator Tony VK5ZAI was the moderator, initially chatting to the students and their families, explaining how the connection to the Space Station was achieved before handing over to Claudio to call the Space Station. Even before Astronaut Kevin Ford came on-line, the gathered audience was impressed as these voices from all over the world were coming through loud and clear into their hall's speakers. The Space Station was expected to clear Claudio's western horizon at 07:34 UTC & almost to the second, a voice came out of the noise and within seconds was noise free. The students immediately started with some questions revolving around radiation exposure, the risk of fire, how long does it take to train for the Space Station, through to some lighter questions like can you roll a dice in space and can you eat spaghetti with runny sauce! The broadcast was linked to the VK2RMP repeater covering Wollongong and Sydney area while also being connected to IRLP and Echolink via John AG 9 D in the USA who was also connected to the NASA Conference Bridge. VK2RMP, but this was to be expected after the audio relay had effectively been around the world a few times! The event was a great success, with the students and families standing around for well over an hour afterwards taking pictures and discussing what they had just heard. Additionally, the local newspaper, radio station and also the WIN Television News covered the event, with Amateur Radio being mentioned many times during the event.